This geneameme was created by Pauleen (Family History Across the Seas) to celebrate National Family History Month in Australia. 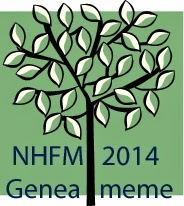 What are you doing for NFHM? I've created a Web page that lists some genealogy discounts and freebies - and (when I need a break from packing up and moving the contents of my house - sigh) I'll index more Queensland State Archives records. What do you hope to learn in NFHM? Whatever I can. My favourite way to learn is to go to the Archives and delve into a record series that I've never used before. Do you research at a family or local history library? Not as often as I used to, but I am still a member of the Queensland Family History Society and the Society of Australian Genealogists. What's your favourite place to store your family tree? With SecondSite and The Master Genealogist I can convert all of my data into HTML format so that I can store and view it as an interactive 'Website' on a CD, USB thumb drive or external hard drive. Irreplaceable or expensive documents are copied onto acid-free paper and stored off-site. I use Dropbox for electronic backups. Part of my family tree (minus living people) is on my own Web site and on Rootsweb's WorldConnect. If offline, which genealogy program do you use? The Master Genealogist (incredibly powerful for keeping track of exactly where each tiny detail came from, and how much I trust the source). How do you preserve your family stories for future generations? (1) I self-published a small book and gave 'legal deposit' copies to the National Library of Australia, State Library of Queensland and Queensland Parliamentary Library; (2) My Web site (which includes a family tree) was selected for inclusion in PANDORA (Australia's Web archive); (3) Some stories go into my genealogy blogs, which will presumably be available to the public as long as Google exists; (4) My will has instructions about donating some of my material to the Society of Australian Genealogist's primary records collection. Have you any special research projects on the go? Lots of research jobs for clients, and an endless list of indexing projects (mental asylum patients, hospital records, illegitimate children, maintenance registers, prison records etc). What is your favourite family history research activity? (1) Doing research in original records at Queensland State Archives; (2) Exploring cemeteries. What is your favourite family history research place/library etc? Queensland State Archives. Also the London Metropolitan Archives and North Yorkshire County Record Office. What is your favourite website for genealogy research? FindMyPast, for reasons explained here. Are you part of a Facebook genealogy group? If so which one? A private group for members of the Genealogists for Families team. Do you use webinars or podcasts for genealogy? Yes - The National Archives (UK), the Society of Australian Genealogists, and some from Legacy Family Tree. Do you use social media? Intermittently (Facebook, Twitter and Google Plus). What genealogy topic/class have you learnt the most from this year at a webinar/conference/seminar? I guess I can't count Kerry Farmer's excellent seminar, Immigration: Why, When and Where, because it was in late 2013. This year I actually learned the most from the research I did while preparing for my own seminar, 'Look Beyond the Border'. Do you have a favourite research strategy to knock down your brick walls? Yes! Research the subject's siblings and other relatives! Have you used DNA testing for your genealogy? Yes. Have you made cousin connections through your DNA tests? Yes. What do you most love about your family history research? Finding 'flesh on the bones' information, photographs, physical descriptions and documents written by my ancestors. This is a great response. You have given me lots to explore - SecondSite and your DNA testing post. Thanks Judy. And thank you too for all the good work that you do for our community and the broader community. Thank you for those kind words, Alex. The way I contribute has changed (and will continue to change) according to my personal and family circumstances; but I will always strive to persuade family historians to use 'neglected' sources in Archives. Pleased to hear the London Metropolitan Archives is on your like list, Judy. I'm making my first visit soon. Have fun at the London Metropolitan Archives, Jill. On one UK trip I was at LMA almost daily for two months, but it's more than ten years since my last visit so the search room is probably even better now. I used to take a packed lunch and eat it in the little park nearby. Thanks for joining in Judy! We seem to be birds of a feather when it comes to family history. I'd love to visit LMA -one day perhaps...two months sounds like heaven on a stick..what were you researching? Oops I didn't think of GFF -will go back and edit mine now. Pauleen, that 2-month trip was pre-Internet, and many of the records I needed were not available through LDS, so my LMA research was mainly for parish registers and poor law. (If I could go again now I'd get stuck into the Middlesex Registry of Deeds.) Apart from London Metropolitan Archives (then called Greater London Record Office) I spent a lot of time at Somerset House for wills, St. Catherine's House for BDMs, Chancery Lane (Public Record Office) for non-conformist records, plus a couple of visits to the Guildhall Library, Society of Genealogists, etc. I was in London from mid-October to mid-December, and I could only afford a tiny, cold, miserable bedsit - but it had a desk, and it was in Islington, within walking distance of LMA!